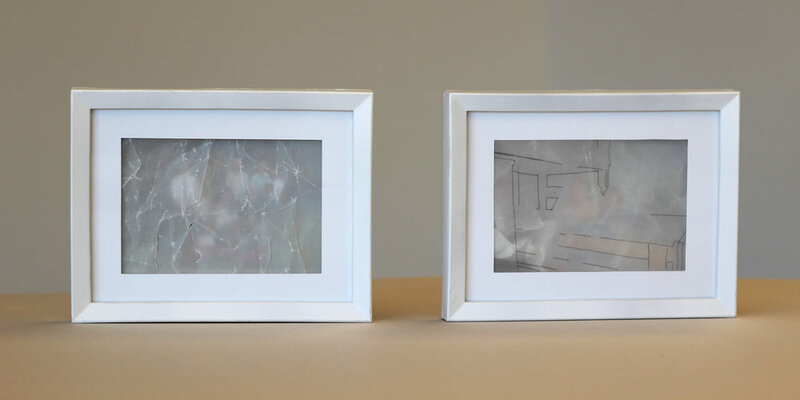 “1997-2001” is an series of family photographs and tracing paper used to create low-relief sculptures as a reflection on childhood, and through the exploration of the nature of memory I try to represent the impossibility of an objective recollection of childhood. The photos were selected from a large collection based on my ability to recall the context of the photo. When looking back on childhood it is natural to take a nostalgic perspective, and as I looked through the photos I tried to objectively remember the realities of being a child and the familial relationships that shape childhood experiences. Through the obstruction of the photos, the paper reliefs serve as a secondary representation of the memories attached to the photo. The materiality of the paper depicts the clouding over of memory, illustrating how elements can be forgotten or highlighted within the recollections. The photo frame situates these reliefs in the context of a family keepsake, examining the sentimentality and presumed authenticity of family photos.